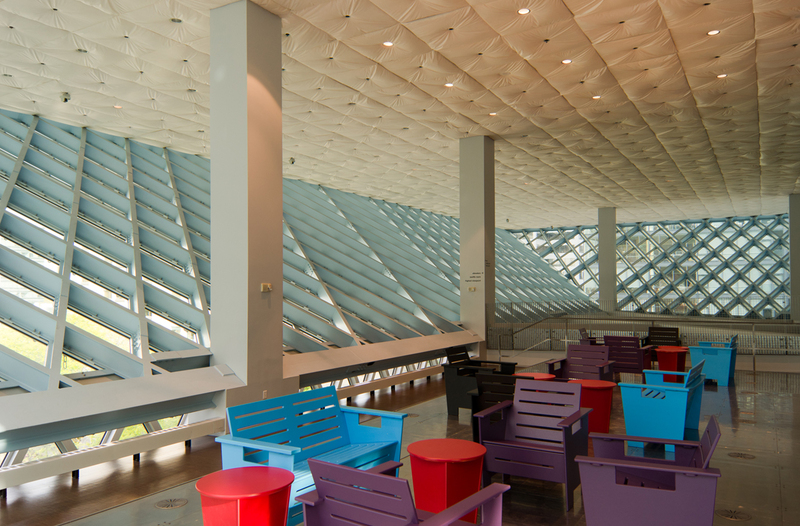 In praise of Seattle's best* building. I didn’t plan to write this. 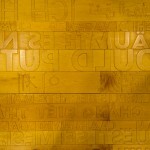 I created this site so I could post work by Sticklab along with a smattering of designs we liked that were relatively unknown. 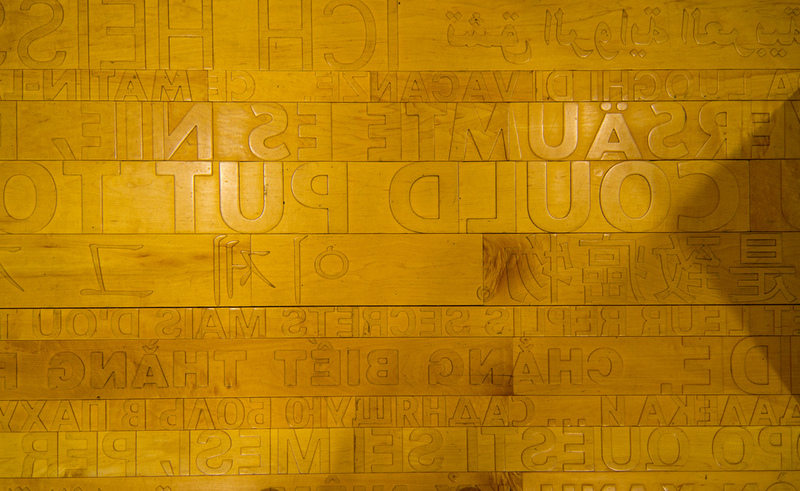 The Central Library is hardly unknown nor was done by any member of Sticklab, although one former teammate does work for the same firm. This all started with an argument, “what’s the best building in Seattle”, I said expecting one of maybe 2-3 responses. I didn’t plan to write this. “St. Ignatius Chapel”, one friend said, “No, the sculpture park” said the other. 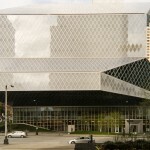 What followed was a discussion of what was truly worthy of being called the best of Seattle architecture. 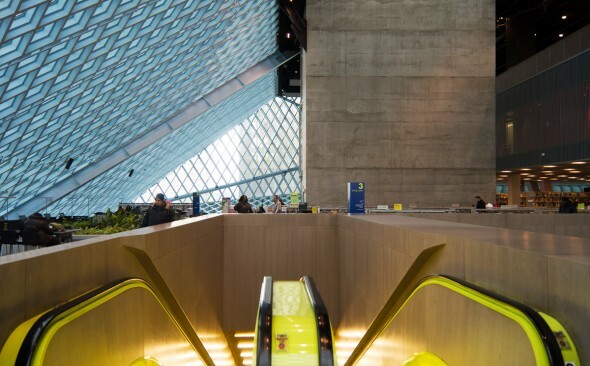 In general, the discussion seemed to hover around St. Ignatius, (a Steven Holl design on the Seattle University campus), the Olympic Sculpture Park (designed by Weiss/Manfredi) or the Central Public Library (designed by OMA & LMN). I became obsessed with the idea that there were other, greater buildings that weren’t the talk of the town. 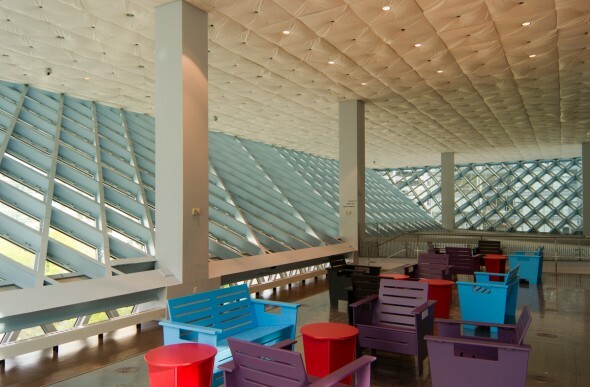 The next week I paid a visit to a few lesser known designs and wondered if it might be possible that Holl or Rem Koolhaas hadn’t designed the best building in Seattle but perhaps Yamasaki, Thiry or Kirk had? 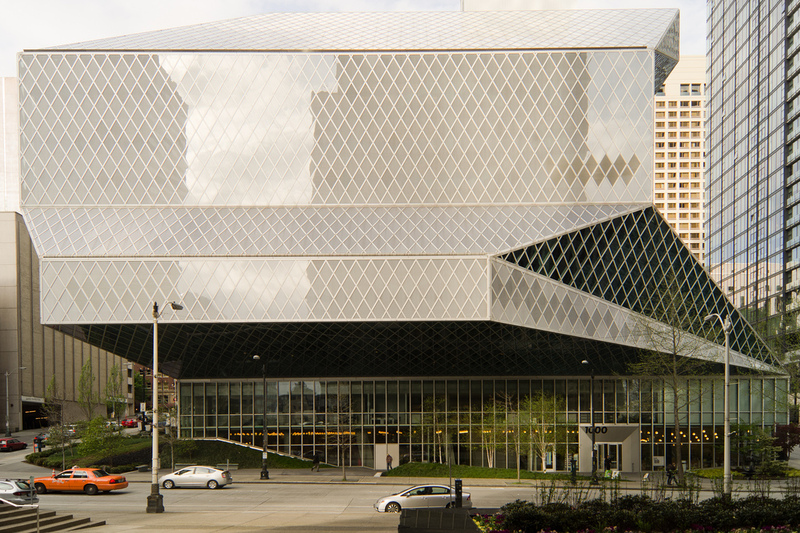 Thus the idea of the Seattle Architecture Showdown was born. 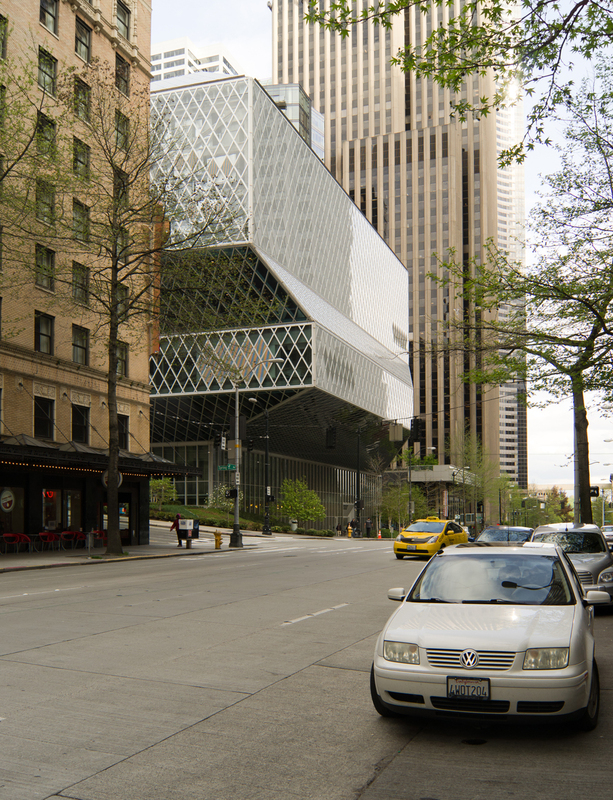 Why not pit the buildings of Seattle in a bracketed tournament format? This would at least get some of the lesser know buildings into the conversation. After soliciting suggestions from friends, colleagues and social media followers, a list of 83 was assembled. Each design was given a weighted score based solely (and unscientifically) on where I thought they would land in the final voting were we to vote for only 1 out of the 83 submissions. This lead to some interesting match-ups and scenarios and, in fact, did give some completely unknown buildings a chance to shine. Buildings that rarely receive attention in polite design conversation like St. Spiridon Russian Orthodox Church or the Loveless Building found themselves chosen as the better building against more established piece of “true” architecture. On the whole I feel that the showdown was a success, it not only gave me a few leads into buildings I should check out but it also got the design community involved in a discussion that didn’t just include our eventual winner and the space needle. 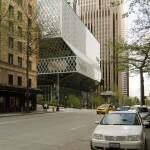 So, after a lengthy (and spontaneous) process we crowned The Seattle Central Library as king of the hill. Seattle has an impressive array of libraries by noted architects, but the central library is the grand daddy of them all, its unique form sets it apart automatically from all other downtown buildings. In true OMA fashion the programming diagram became the actual section, a shifting series of boxes that house different aspects of the modern library. My first real experience with the building came shortly after graduation, I was on one of several visits to Seattle to do interviews and job-hunt and I used the library as a central hub. I imagine my interest at the time was much like everyone else, less about books and more about the public services the library provided. SPL was a nice refuge to provided access the internet, restrooms and areas to sit and relax. Those three areas are where OMA’s design really shines and clearly were a big part of the overall big idea. Modern libraries are utilized for so many other things than simple storage facilities and this one seemed to take that into account. 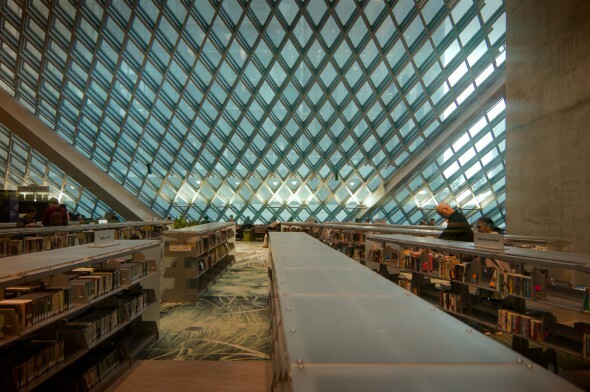 However, after moving here, I began using the library as a resource for books, that’s where I became frustrated with certain aspects of the design. Why did I have to access the bookstacks via a narrow escalator that only stopped on 1 level? 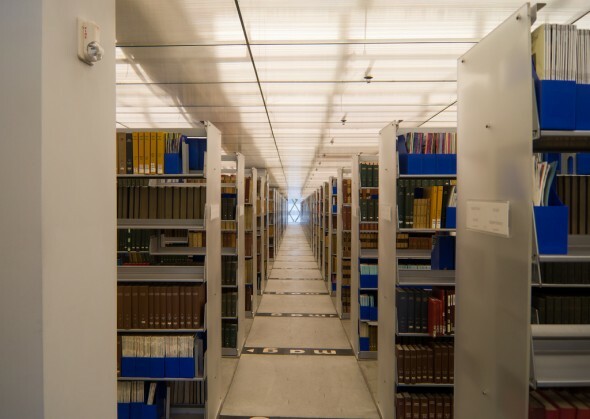 In fact if you visit the building with no prior knowledge about the book spiral it’s unlikely you’d even know it exists, the spiral is trapped in a cube high above the spacious “living room” and “mixing chamber”. This is partly due to the fact that fiction books are located in that living room, so if you visit and see that comparatively small book area your first thought might be, “that’s it?”. There is no grand stair that leads to the palace of info above just this small narrow portal. 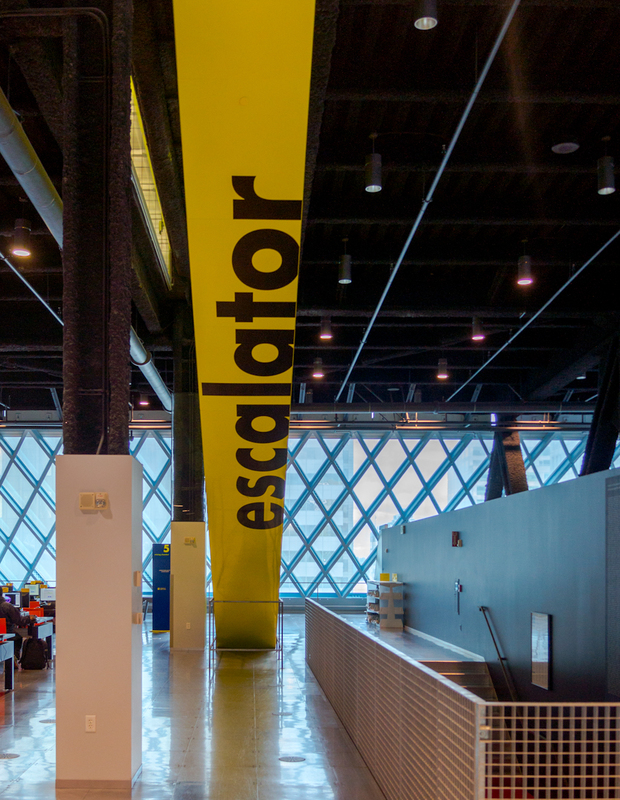 Once you’ve entered the spiral, going up or down within it is relatively easy but getting out back to the more public areas of the library requires the use of the elevator or a small fire stair. There’s a creeping sense of claustrophobia that goes along with the book spiral that I’ve never liked. I don’t like how the spiral is entirely sectioned off from the library and I wish there had been some bleed between old and new tech. However, maybe this will change in 10-20 years, maybe the spiral will become the climate controlled mausoleum and we’ll all be accessing digital copies of SPL’s collections while relaxing in one of the central libraries many plaza levels. Only time will tell. Despite its circulation idiosyncrasies I still enjoy visiting that building, the plazas and auditorium get regular use and on a whole the experience is a pleasant one. In addition, this glasshouse is always filled with natural light, even on the gray cloudy days we so often experience in winter, and for that OMA and LMN deserve a hearty thumbs up.